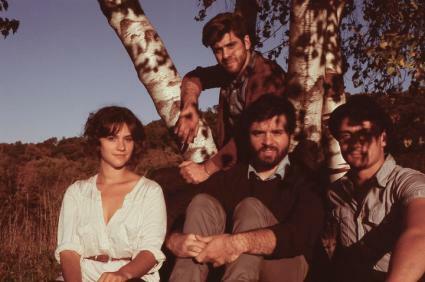 New York indie folk quartet Swear and Shake played the Hillstock fest last week, and will cement their status with a CD release party at Mercury Lounge on Friday July 6 with These Animals and Tall Tall Trees. The moniker itself captures a certain quality to the group’s vibe, evoking the rhythmic and fitful, but most distinctly their togetherness - as if these four, somewhere on a playground long ago, entered into a pact of musical dimensions. Undoubtedly there is a spirit of play to the music, resulting in songs that toss between childlike vulnerability and wonder, and resounding harmonies that beautifully elevate the stuff of good old indie-folk - The vocals alone, shared between Kari Spieler and Adam McHeffey, are fodder for obsession.